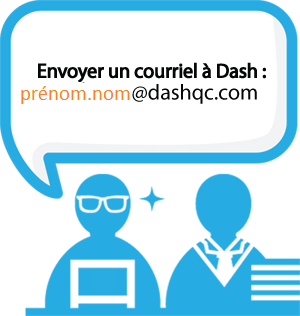 Dash Computer Solutions is a close-knit team of programmers, product specialists, and scheduling technicians working together to provide software, services and support to over one hundred schools in the Greater Montreal area. From Dash's beginnings in 1985, we have focused on close contact with school personnel to provide tailor-made solutions that answer their specific needs. Over the past few decades, Dash Computer Solution's client base has grown in number and variety. Our clients include schools in the public and private sectors, French and English school boards, and both secular and religious schools. We are one of the leading software companies to offer a comprehensive school administration solution for Jewish and Muslim schools. Dash Computer Solutions software provides a full line of integrated modules to handle schools' administrative needs. Although the different modules work in concert, a school that is tied to an existing IT system can often benefit by purchasing individual modules for their most pressing needs. What distinguishes our offerings from those of our competitors is increased software customization, closer communication, and better scheduling algorithms. All of our modules include installation, training and ongoing customer service with our team of Dash experts. Contact us for more information, or to purchase Dash modules. Dash has a wide range of reports, schedules and letters that can be generated at the click of a button, while also offering users the ability to create custom reports, letters and labels using the Report Generator. Learn more about Dash's reports, letters and labels! Dash is pleased to offer customized report cards and schedules in Hebrew, Yiddish or other languages to our schools. Please contact us to find out what services we could provide for your Arabic, Greek, Armenian, German, or other language schools. Learn more about Dash's multi language services! Dash provides custom software development and consulting for organizations. Contact us for more information.